1) What are your own origins, James? Plus, what path did you take in life prior to getting to where you are today? I came from pretty humble beginnings. And then I started traveling and seeing more of the world, more of how the world works in respect to different cultures and locations. I’ve always had a curiosity for how people interact with others, and the little things that set one society apart from another. From there, I just started creating stories and characters, and people dug them, so I kept at it. 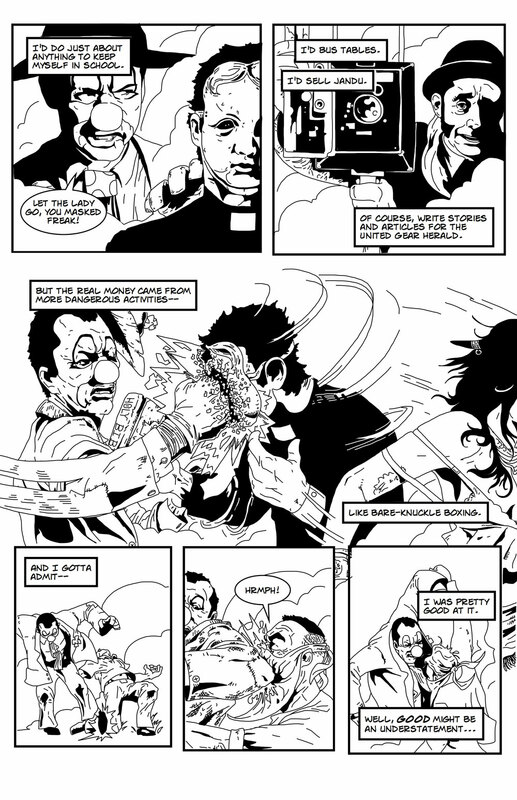 I’ve worked in fiction and as a journalist, but creating comics has been the most rewarding method of storytelling. I like the people who revolve around comics, mainly because they are open and accepting to new concepts. Back during Free Comic Book Day, I was tabling at a local comic shop and met this guy who said he was an artist. When you’re outside the confines of a comic con, usually what happens after that statement is made goes either really good or really bad. Luckily for me, Brandon wasn’t selling bridges. His art was brilliant, and when he said he was interested in collaborating, I knew I had to come up with something quick. During the same time, I was facing the prospect of finding a new job, and unfortunately, the only jobs that seemed to be available in the area were ones that held little interest for me. I had recently moved and my background was in newspapers: writing news articles, creating ad copy, or designing layouts for publications. All of a sudden I was in a new location that had no openings for those skills. So faced with the need to create a new script for Brandon and the looming uncertainty of what terrors could await me in the job field, I wrote a scenario in which a character found an employment opportunity becoming a circus clown, and how (despite his precautions) the work that he tried to distance himself became an identifying factor to him as a person. I finished the script right after Heroes Con and sent it Brandon’s way. 3) In your own words how would you describe this tale? Clown tells of former-journalist, Jared Bastian, who now makes his living as a clown in a roaming circus. When a group of revolutionaries attempt to spread their agenda during his performance, Jared puts a forceful stop to them and finds himself at the center of the Empire's attention. 4) What song would you say best represents this project and why? I can’t really pair a song with the project. I’m sure there’s something that matches the theme and mood, but my brain rarely works that way. I’m open to suggestions, though. The sad thing is that a lot of people would take this story as a call to rebel against the “Authority”, and might try pairing it with something by Rage Against the Machine, like “Killing in the Name”, but Jared isn’t rebelling against anything political. He’s acting out against the things that threaten the things he cares about. It’s the rest of the world that’s seeing his actions as politically driven and trying to cast him as a politically motivated character. Jared fights the rebellion because they strong-arm the girl with which he has a romantic interest. He rebels against the monarchy because they try to make him do something that doesn’t live up to his self-perception. None of this is because the monarchy is evil or the resistance movement is wrong. Truthfully, Jared could care less. This is his world, they’re just living in it along side him. 5) If you could get a celebrity – either living or dead – to promote your wares, who would you choose, and why would you want to choose this particular person? 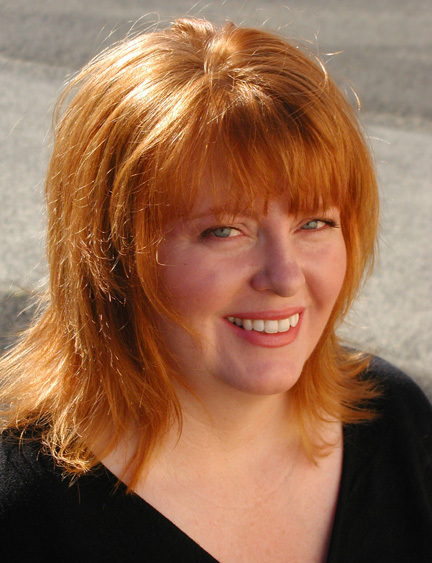 Gail Simone, which is awesome, because she actually gave me a positive shout-out after reading Clown. After she posted her compliment and got in touch with me, I couldn’t stop smiling for hours. She’s a creator that I’ve enjoyed for years. 6) What have you learnt about yourself through this endeavour? And were their any unforeseen obstacles you had to contend with along the way? As far as obstacles, none have really surfaced. 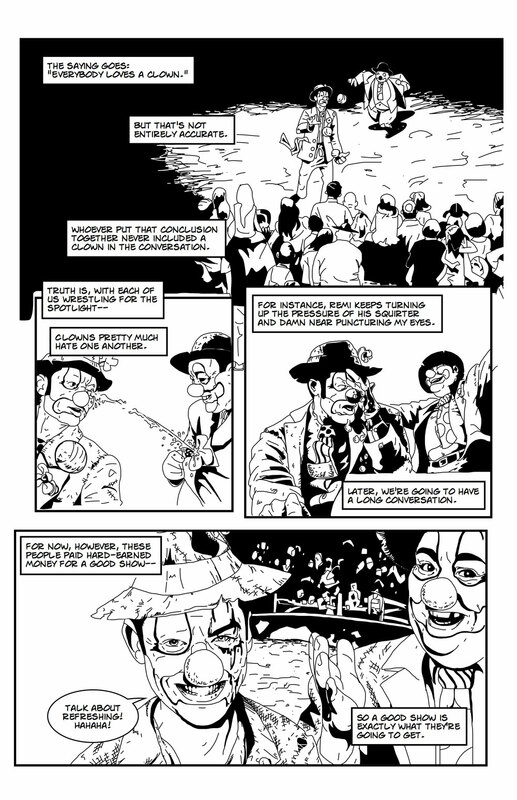 So far, I’ve had pretty good luck with comic projects, and “Clown” has kept to that course. The artists I’ve worked with are the best, and we’re both driven to getting out top-quality stories to our readers. As far as what I’ve learned, I will say this: I was quickly struck with just how powerful the impact of a short story can be. The positive reactions both Brandon and I have received from this short 28-pager have been mind-blowing, and it makes me happy to know that a comic doesn’t have to be seventy-three issues or seven volumes long to get noticed. 7) During your time in this field, what is the one thing that has kept you in good stead? For me the community of awesome readers and helpful creators has always kept me happy and engaged with comics. I’ve been lucky enough to attract readers who eagerly dig into my tales and enjoy the settings and characters I produce. I they keep reading, I’ll keep writing. 8) If ‘Clown’ had a motto, what would it be? You’d think it would be something like “Stick to your principals, no matter what” or something empowering like that, but the truth is I’m not quite sure that is the best direction to drive readers. Jared isn’t exactly a hero in this story; he’s just a guy who rarely compromises on personal beliefs. Whether that will open him up to a brighter future is debatable. So there you have it, dear reader. 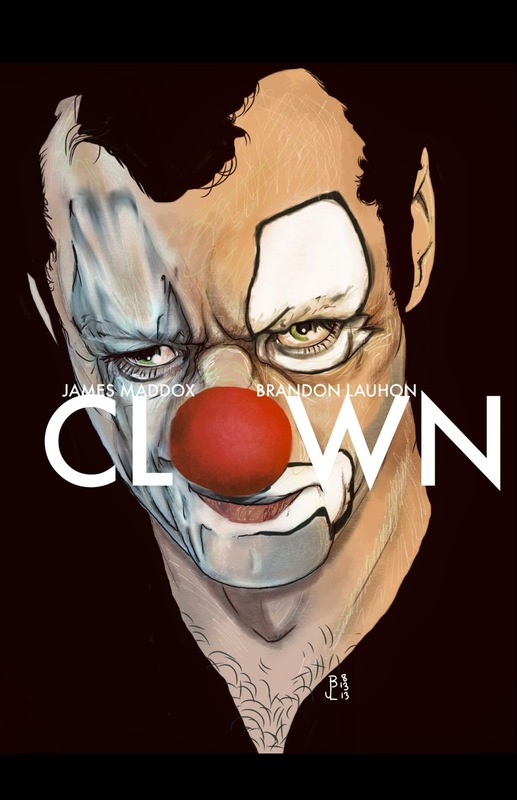 My mate James and his great comic book, 'Clown'. When you've got the time please click on over to his website and twitter pages to see what he has in store for us next. Cause I bet you anything it'll be one hell of a treat, Honk-Honk!